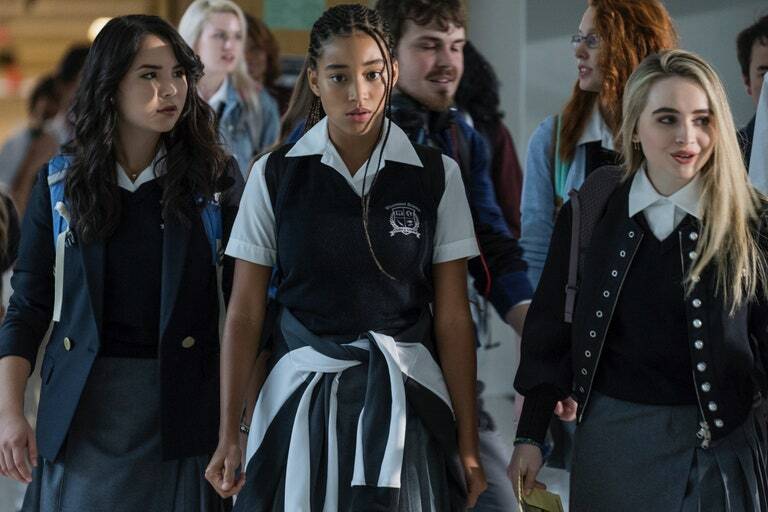 In a marketing move that went awry, the American police shooting drama, The Hate U Give inspired mass walkouts at ‘Cineworld Unlimited’ Surprise Preview screenings across the UK on 8 October. The last Cineworld Unlimited screening was The Incredibles 2 so audiences were primed for a tentpole release. Fearing it might be the new Hallowe’en movie anxious parents contacted Cineworld sites to ask whether their children might be turned away. There was also some consternation that customers weren’t given complimentary candy, dished out at previous surprise screenings. What the heck, indeed! Adapted from Angie Thomas’ novel by the late Audrey Wells (The Truth About Cats and Dogs, Under the Tuscan Sun) and directed by George Tillman, Jr (The Longest Ride, Men of Honour), the film tells the story of African American teenager, Starr (Amandla Stenberg), who grows up in two worlds. Whilst she lives in the deprived neighbourhood of Garden Heights, where her father runs a store, she is educated at a school notable for the rarity of students of colour. Daddy (Russell Hornsby) drills his children to behave appropriately when stopped by a police officer – something they are taught to expect. However, whilst she is being driven home from a party by an old friend, Khalil (Algee Smith), Starr is unable to stop him from being shot. In the aftermath of the outrage (this is not a tragedy, rather an ongoing injustice) Starr struggles to articulate an appropriate response. In the film’s best scene, Starr visits her police officer uncle, Carlos (Common) and they discuss why officers respond the way they do. White motorists are given the benefit of the doubt; black motorists are not. The scene works exceptionally well because it admits that this attitude is held by both black and white officers alike, but is rooted in bias about social background; whether the motorist is likely to own a vehicle, have committed infractions of some sort or carry a gun. In many of the other scenes, this bias is presented as a white institutional problem. Yet the drama plays out against a criminal backdrop: Khalil worked for a local drug dealer, King (a nuance-free performance by Anthony Mackie) to pay for his grandmother’s medical treatment. The police officer’s suspicion therefore has some merit, though not his trigger finger. Far from being an articulate film that decries racism, The Hate U Give is deeply confused. Starr’s parents consciously address environmental determinism rather than attempt to reform the neighbourhood from the inside. Although her father runs his own business, his ambitions are economically limited. He had turned away from a life of crime to be a good father, albeit in a drill sergeant mode, but is content for his children to live in a white world. The film creaks with a lack of authenticity, notably in Starr’s romance with Chris (K J Apa) a white student at her school, who is something of an embarrassment – a class clown who is singularly unfunny. Chris exists in a vacuum. We don’t meet his parents or his other friends; he is there as light relief – or should I say white relief. Starr’s relationship with two white girls in her class, one of whom takes part in a protest against police brutality to avoid a chemistry test, is somewhat more believable, but the film makes the mistake of presenting teenagers as finished articles, and not capable of change. The lack of authenticity extends to a funeral reception that Starr attends for Khalil, where the family members aren’t so much traumatised as under-directed. The film builds to a scene of rioting that also seems under-populated. The worst thing about The Hate U Give is that it presents Starr’s acknowledgement of outrage as triumphant when in reality nothing has changed. The way to address a culture of fear is to debunk it, which is why a number of first time African-American writer-directors, like Jordan Peele and Boots Riley have turned to black comedy rather than social realism. The Hate U Give feels like a throwback that could have been made five years ago. President Trump’s war on his predecessor’s legacy demands a more considered response. The Hate U Give is out in cinemas now!